This cake reminds me of my childhood parties. 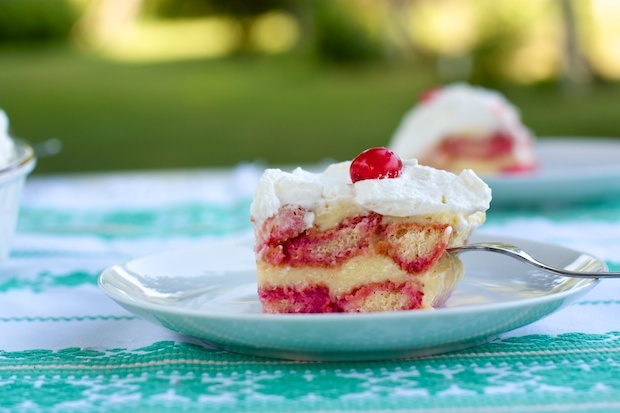 I do not know exactly why it’s called “Zuppa Inglese” (English Soup) since it is very Italian. I think the name is linked with the key ingredient in the cake, the Creme Anglaise or English Cream, this cream is a cream without flour and with a greater number of egg yolks. The lack of flour makes the most delicate cream with greater liquidity, so it makes such a soft dessert to the point that it can be called a soup. When you cook the Creme Anglaise, be careful and only thicken it slightly. It must never boil otherwise the yolk coagulates and preparation breaks becoming inedible. Today, thanks to cornstarch that is almost tasteless, it is easier to prepare a cream similar to English without worrying too much about the cooking. A trifle is a dessert that is the quickest and easiest way I treat emergency situations in which I have little time, but still making the guest feel pampered. The ladyfingers I usually use are Sardinian cookies that are larger and flatter than the ones that you normally find. Alchermes, an almost fluorescent red liquor, characterizes the trifle. In a book of Italian cuisine by Mario Batali, renowned chef in New York, calls into question the use of Alchermes precisely because of his phosphorescent color. Surely the dyes are not to be approved, but on occasion you can make an exception to the rule. This liquor can be replaced in the same quantities with Amaretto or with coffee. 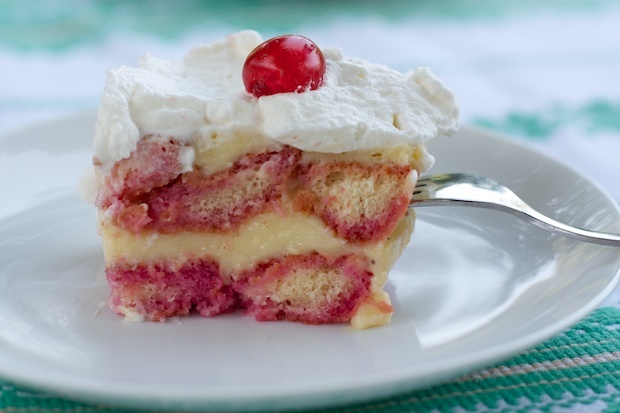 The trifle is best if prepared the day before being consumed. Add the cup of water in a saucepan, and using the same cup, add ¾ cup of sugar. Bring to a boil and turn off. Add the Alchermes and pour the mixture into a bowl. Bring the milk to a boil with the lemon or orange zest. In a bowl beat the egg yolks with the sugar and when they are well mixed, add the cornstarch and mix. Slowly the milk in slowly on top the mixture and with whisk mix well again. Pour the preparation into the pot of milk and and let it thicken, stirring constantly for 5 minutes. Remove the orange zest. Soak the ladyfingers in water stirring in the Alchermes, place a layer in a baking dish. Pour half of the cream that is still warm and cover with another layer of soaked ladyfingers always, finally pouring in the remaining cream. Before serving, whip the cream by adding the vanilla. When the cream is well fitted pour icing sugar and mount for a few seconds. Spread the cream over the trifle and decorate with candied cherries.